Leading media buffs agree that the era of mobile devices has arrived in full force. A recent Microsoft study proposes that by 2014, more people will access the Internet through mobile devices than desktops. And with nearly 1.5 million apps now available for Android and Apple platforms alone, the quality of mobile photography – combined with the ease of capturing and sending media – has ushered in a new age of digital photography. 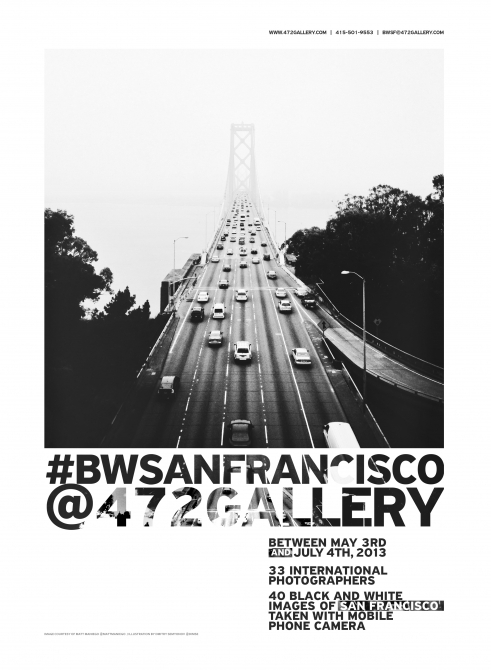 To highlight this emergent technology and the increasing influence of mobile in all aspects of contemporary life, the owners of 472 Gallery are offering a photography show compiled entirely from images captured and posted using mobile devices. The show is being curated by SF-based Denis Krylov (@Krylov) - an owner of 472 Gallery and a principal of the next-generation creative studio Transparent House and Melbourne-based Misho Baranovic (@Mishobaranovic) in collaboration with the prolific Instagram #jj creative micro-community and Streamzoo's mobile photo-sharing app. #BWSANFRANCISCO leverages the prolific communities within a growing number of mobile platforms around a subject matter near and dear to mobile photography, the city where the medium gained its fame… San Francisco. The gallery’s curators invited photographers to submit original works captured using their mobile devices with the hashtag #BWSANFRANCISCO on Instagram. The 40 images from 33 photographers, touch on a number of styles and subject matter, while sharing two commonalities: all were posted in a black-and-white format and all were taken within the 7x7 expanse of the tech-savvy City By The Bay. Mobile photography apps such as Streamzoo and Instagram have opened a new world to photographers, allowing them to take their art to incredible new heights, while incorporating real-time sharing, geo-tagging and social networking. Through its offering, #BWSANFRANCISCO represents a significant shift in the way we view art and photography and will bring to light new art forms in its wake. The show opens Friday, June 7, 2013 at 472 Gallery with a gala reception for hundreds of luminaries from all over the Bay Area, the United States and abroad, and will run through July 4, 2013. We look forward to seeing you at this trailblazing event.